All through the night, I’d been tossing and turning in my bed. A drowsy mistake had cost me 128GB of lost photographs over the past 2 days. A Cut-Paste job gone horribly wrong (I know! Always do Copy-Paste-Check-Format. What was I thinking?! One more whack on my head.) Getting out of bed, I’d decided that today was going to be a new day. A new beginning to my visit to Kruger National Park in South Africa in July 2018. As we rolled out of Satara Rest Camp, the grey clouds that had gathered last evening had slowly started to dissipate. The rising sun was still trying to make its mark on the day. The burnt grass of the savannah here seemed to be ever-hopeful of a new beginning too. Last evening, we’d seen a pride of Lions lounging. Their golden forms beautifully contrasted against the dark surroundings. We were scanning both sides of the path hoping to catch them in the morning light. Neil, our driver and guide, spotted something crossing the road. A Civet, he thought. 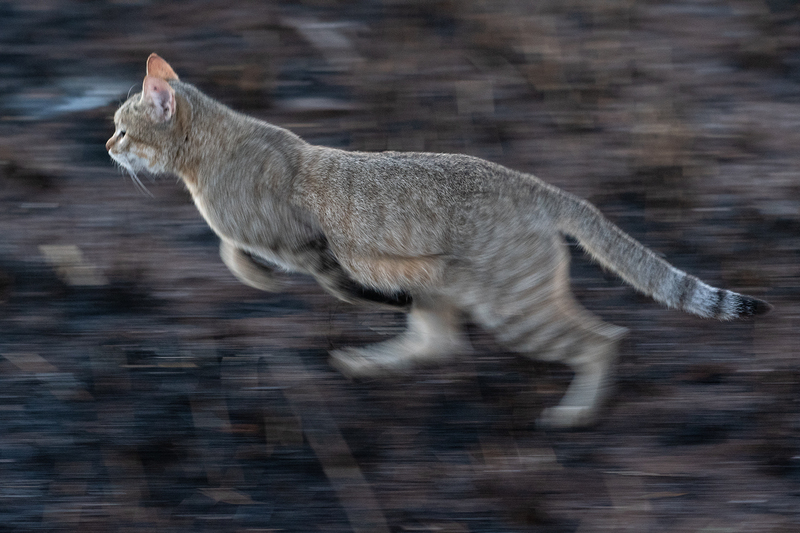 As the vehicle came to a halt, our eyes searched the grasslands for an animal that might be running away quickly from us. Did we miss it? As my eyes wandered back towards the road, an inquisitive pair of eyes stared back at me. A South African Wild Cat (Felis lybica cafra)! It is widely considered to be the ancestor of the domestic cat. Though it is a species that is quite widespread across Africa, it is not an easy one to see due to its secretive and largely nocturnal nature. In a decade of driving around Kruger, this was the first time that Neil was seeing one! 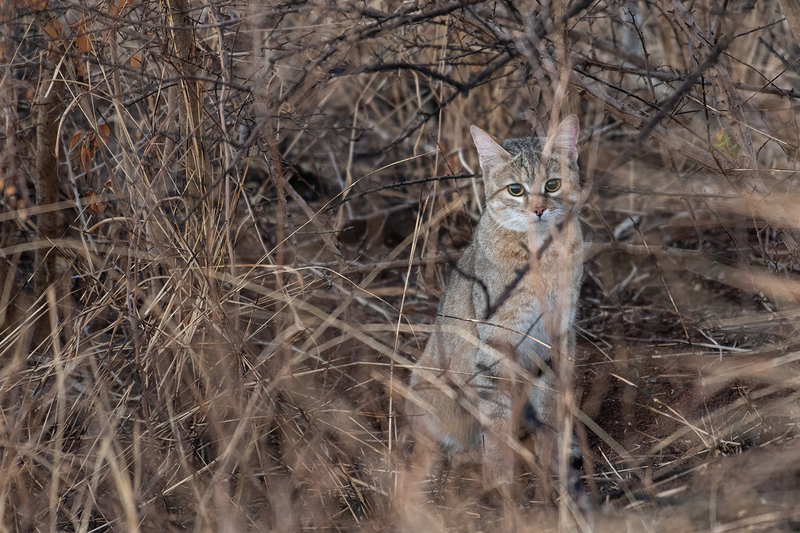 As more vehicles stopped by to see what we were observing, the cat seemed to get a bit flustered and made its way into a thicket. As I read up more on the African Wild Cat, I understand that they form a species complex with the European Wild Cat. And then, I realize that I’ve seen its cousin closer to home. 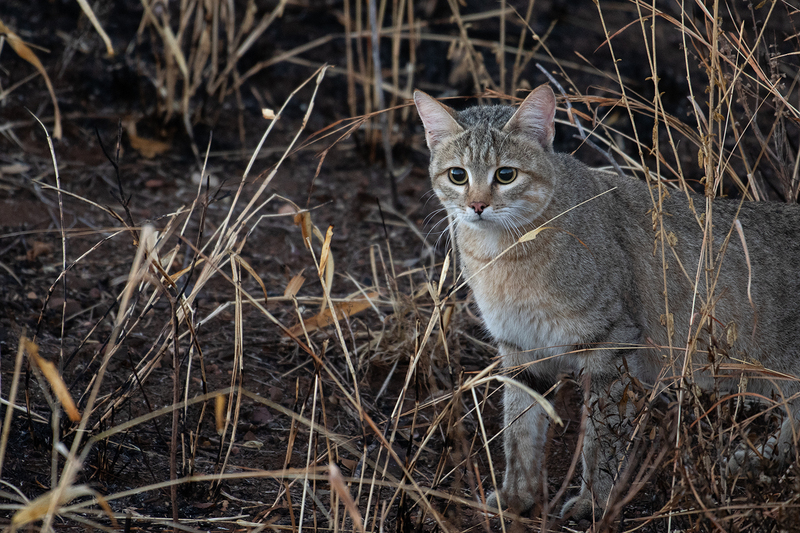 The Indian Desert Cat (Felis lybica ornata), that was previously considered a subspecies of the European Wild Cat, is now classified a subspecies of the African Wild Cat (more details here – Revised Taxonomy of the Felidae). 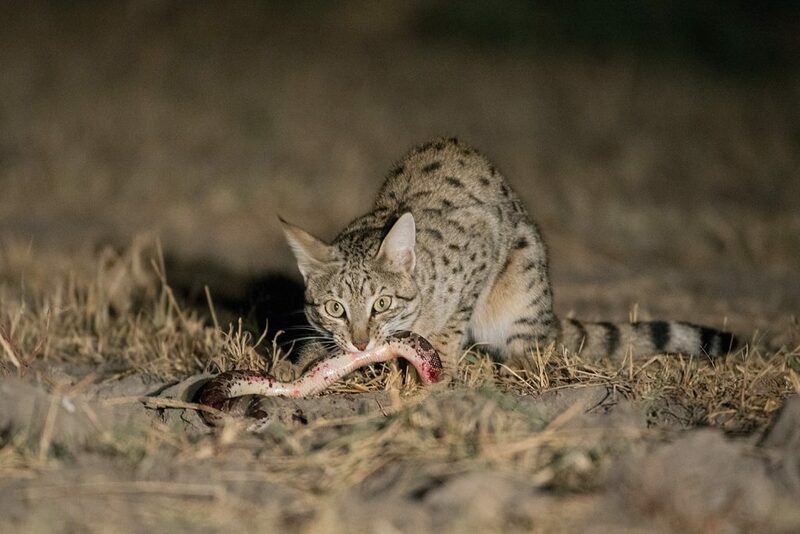 A few winters ago, while driving out of the Little Rann of Kutch one evening, we’d come across an Asiatic Wild Cat feeding on a snake! Both species of Wild Cats have very wide distributions to be considered threatened. However, wherever there’s human contact, there seems to be a high risk of hybridization with domestic cats. Back in Kruger, the sun was breaking out of the clouds. 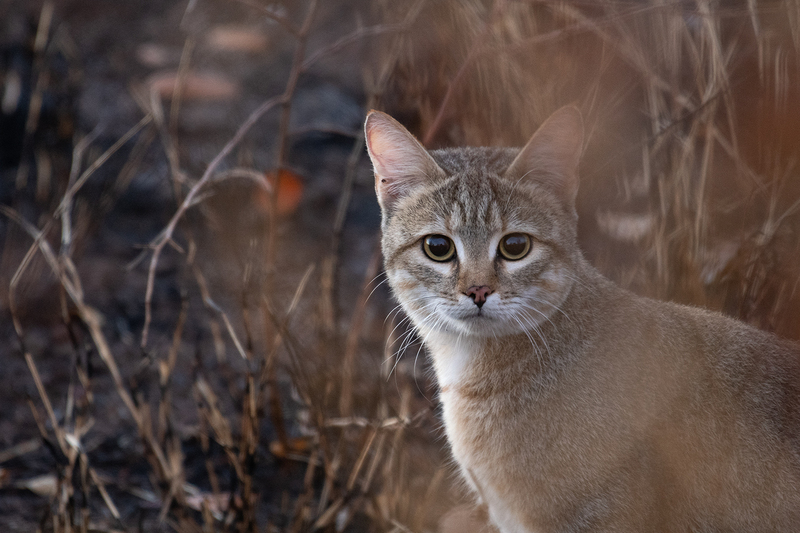 The cat, probably not used to the attention that it was getting from the vehicles passing by, darted across the burnt field and crossed the road once again to disappear into the taller grasses on the other side. This sighting was from a Wildlife Photography Tour of Kruger National Park, South Africa that I’d conducted for Darter Photography in July 2018. « My first Snow Leopard! As interestingly narrated as the pictures! Very interestingly written. Educative information. Lovely pictures. Enjoyed. (Ps: Hmm! don’t transfer images when you are sleepy ).